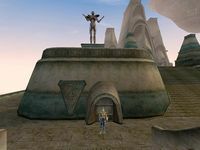 The Hall of Wisdom is located on the east side of Vivec's Temple Canton. This is the main hallway, which connects to all the other areas. It extends from the north end of the Temple Canton to the south, with exits to the outside on both ends. Near the entrances on either end are hatches that lead to the Hall Underworks. A door on the east side leads to the Hall of Justice. The two doors up the stairs at the southern end, as well as the southern door in the upper hallway, all lead to the Canon Offices. The door on the west side of the upper hallway leads to Mehra Milo's private quarters. The door on the east side leads to the Canon Quarters. 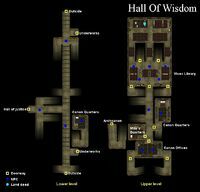 A door up two flights of stairs on the west side near the door to the Hall of Justice leads to the private chambers of Tholer Saryoni in the High Fane. Be careful about entering this door, however, as it locks behind you, and you'll need to either pick a lock in front of the Archcanon himself, or find another means to get out without raising alarm. The other five doors on the northern end all lead to the great Library of Vivec. This small office is occupied only by Adrusu Rothrano and an unnamed Ordinator. There is very little of interest here, and in fact the only real reason to even visit this location is to look at a copy of The Wolf Queen, Book V, a skill book for Speechcraft. There is virtually nothing else of value here. This small room serves as sleeping and living quarters for one Mehra Milo, though you will never find her here. She will leave a note for you on her desk during the Mehra Milo and the Lost Prophecies quest. Other than that, there is no reason to go here, though the bed is free to use, and you may freely take every item in the room without consequence (though there's not much of value). There is little reason to visit this location either. The two NPCs living here are not quest-related and have no unique information. And there is virtually nothing here of any value.